Magnificent Grade II listed Victorian country house, located near the Welsh north coast. Operating as a country hotel, this unusual turreted mansion is set in 200 acres of rolling parkland, with formal gardens and woodland walks. The castle gallery is host to over 100 paintings from the National Portrait Gallery, plus a regular series of exhibitions. Changing calendar of outdoor activities and events. Facilities: Parking, accommodation, licensed restaurant, picnic area, range of leisure and spa facilities, daily activities and nightly live entertainment. 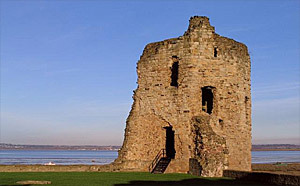 Romantic castle ruins, beautifully sited on the banks of the River Dee. 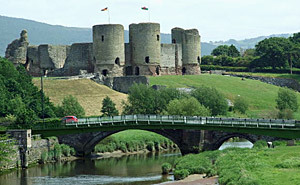 Built in 1277 by Edward I, as one of the first defensive castles in Wales. The great tower (or Donjon) and parts of the walls and corner towers still remain, separated by a moat. Fascinating museum set in a 70-acre Heritage Park with extensive woodlands, reservoirs and ancient monuments. A popular picturesque mountain pass in Denbighshire, which runs between the Llantysilio Mountains in the west and the Marilyn Cyrn-y-Brain range in the east. 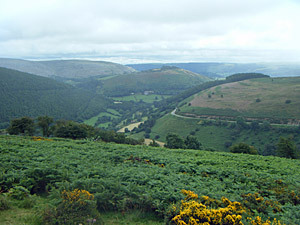 Can be reached by taking the A542 from Llangollen to Llandegla. Care should be taken when driving through the pass as sheep often walk in the road here. Standard gauge heritage railway that runs classic steam and diesel trains along a highly picturesque stretch of the Dee Valley, from Llangollen to Carrog (15 mile round-trip). Large inland lake/reservoir, surrounded by rich heather moorland and forestry. 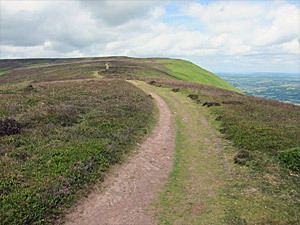 Good walking country with several clear way marked trails. Family friendly attraction with an adventure playground, picnic area, cafe and visitor centre. 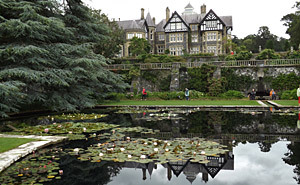 With a walk-through exhibition that explains the history of Llyn. Other facilities include sailing, boating, fishing and cycle hire. The oldest timbered town house in wales, circa 1435. Fully restored. Museum Exhibits. Activity adventure centre, with climbing, abseiling, hill walking, mountaineering, snowshoeing, canoeing, kayaking, gorge scrambling, navigation workshops and bush crafting. Restored Grade II listed 17th-c. Jacobean mansion. Lovely Gardens. Said to be the most haunted house in Wales. 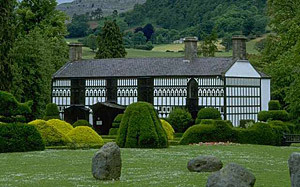 Made famous by the two Ladies of Llangollen, Lady Eleanor Butler and Miss Sarah Ponsonby, who lived here from 1780 to 1831. Much of the original period furnishings and contents still remain, including fine stained glass windows and carved wood panelling. Surrounded by lovely formal gardens. 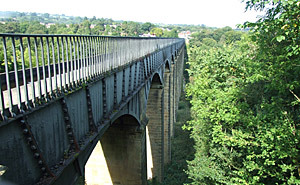 Pontcysyllte Aqueduct and Canal. Designated as a UNESCO World Heritage Site. Built by Thomas Telford and William Jessop between 1795 and 1805. 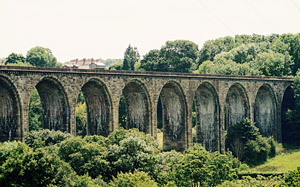 The viaduct is 1007 ft long and crosses the River Dee, using 18 piers and 19 arches, each with a 4.5 ft span. It holds 1.5 million litres of water can be cross by boat or on foot. Location: Near Llangollen, signposted from the A539. Extensive ruins of Norman Castle built at a strategic location on banks of the River Clwyd. The site was fought over long before the fortifications ever existed. In 795 the Welsh were defeated here by the Saxons under Offa. A working farm set in the beautiful Welsh countryside, alongside the Cefn Viaduct and River Dee. Animal feeding, children's play area. 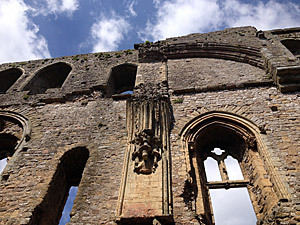 Substantial ruins of a Cistercian abbey. Founded by Madog ap Gruffydd in 1201. Located in a deep narrow valley near Llangollen. Noted for its beautifully carved grave stones. Exhibition covering the life of the Cistercian Monks and the abbey. Estate of Wepre Hall, with extensive parkland and woodlands leading to the 12th-c. ruins of Ewloe Castle. 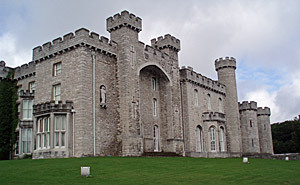 Ewloe is a native Welsh castle, near to the spot where Henry II was defeated in 1157. Several of the towers and upper ward still stand. Regular countryside events. Responsible dog walkers welcome. 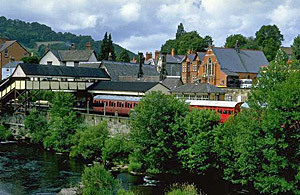 Denbighshire: Abergele, Denbigh, Llangollen, Ruthin. 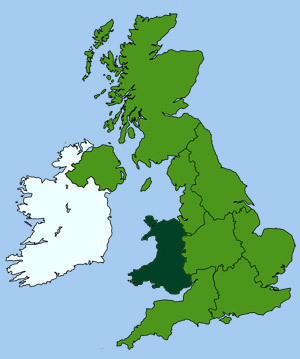 Flintshire: Connah's Quay, Flint, Holywell, Mold, Prestatyn, Rhyl, St. Asaph.